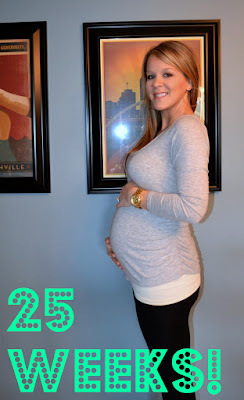 A Lovely Little Life: 25 weeks!! How Far Along? 25 weeks, 4 days – only 101 days to go! Stretch Marks? Nope, but lathering up all the time! Sleep? I realized over the weekend how much of a necessity that pregnancy pillow is....I slept horrible...and was laying there missing my pillow buddy....I am still catching up! Movement? Yes, our little dancer is still dancing strong! Food Cravings? Coffee, I had some decaf that my fabulous cousin made me and it was like the best I ever had! Symptoms? heartburn is still just about every night, back pain is better though. Happy or Moody? I think I have been a little moody, I blame it on lack of sleep. Best Moment of the Week? My shower over the weekend! Looking forward to.... ordering some of the pretty decor for baby girl's room! You look so wonderful and happy! Happy 25 weeks! Almost there! Hope I'm as cute when I get preggo! You look adorable! Yay for 25 weeks, almost there! not too much longer although it may seem forever! Look at that precious little bump! You look fantastic, girlie!